Our church leadership consists of the Pastor, Rev. 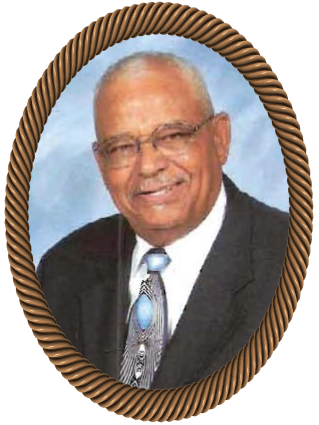 James Watts, Sr.; ten (10) Deacons; six (6) Associate Ministers; and many Auxiliary Heads. Our leadership is responsible for the spiritual and administrative needs of the church. The Pastor teaches, and preaches the Gospel of Jesus Christ and leads the people into righteous living, a life of faith, trust and obedience to God’s Word. The Pastor also sets an example for the congregation. The Pastor also supports the spiritual and physical growth of the church. Associate Ministers support the Pastor through preaching and teaching the Gospel of Jesus Christ. Each has a role and responsibility to assist the Pastor at each worship period. They are also to help support the spiritual and physical growth of the church. Rev. Alfred Ford Rev. Lawrence Howard Rev. James Watts, Jr.
Deacons are to demonstrate spiritual leadership by serving the Pastor and the congregation by supporting and encouraging the members, by visitation to the sick and shut-in members, intake new members, make arrangements for baptism, make arrangement for the Lordâ€™s Supper, provide benevolence service to the members and community to those who need assistance, and to oversee the budget and other financial needs of the church. Deacon Sidney Williams, Chairman Deacon Wayne Allen Deacon Barry Burkett, Sr.
Deaconesses assist the deacons with baptismal ceremonies, preparing the table for the Lordâ€™s Supper, greeting and assisting new members. Planning and Development Board plans, addresses and oversees issues and concerns relevant to the physical structure of the church and its grounds. The board also organizes funds, such as pledges, to support the construction of the existing buildings and for future phases for construction.